Buckinghamshire Fire and Rescue Service. Scania 94D 260 /Emergency One UK. Rescue Pump with 8 person cab. Seen at High Wycombe fire station only days after going on the run. A very smart looking pump. In the future all station will be having Scania appliances. Added by Mike on 14 February 2006. 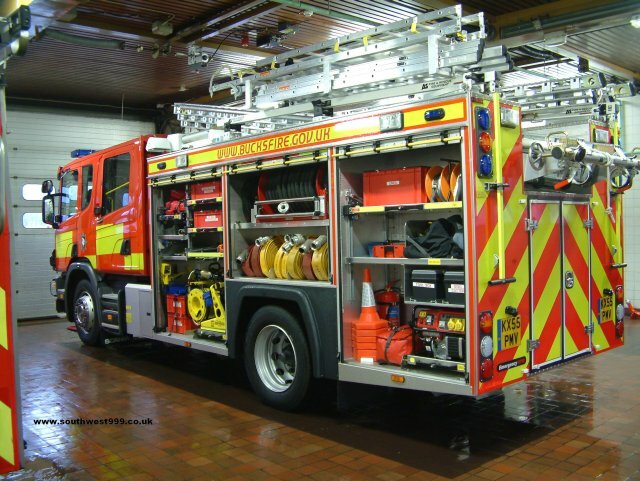 Nice photo mate, these buckinghamshire scania pumps are really nice appliance's! Added by Fozaib Khan on 12 August 2007.
so it is manned by a 8 man crew now? Added by Jake Caswell on 12 June 2009. No, these are carry a crew of 5. Added by Mick on 02 July 2009.